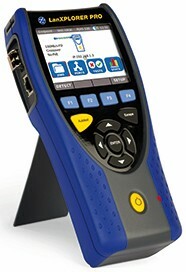 LanXPLORER PRO is an exceptional In-Line Active and Passive network tester from IDEAL INDUSTRIES, INC. It offers unsurpassed test capability for Local Area Network management with state-of-the-art touchscreen interface and large clear color display. LanXPLORER PRO is a high quality, powerful, convenient and easy to use tester unrivalled by any other product available today. Contact our Data Communication Specialists today.